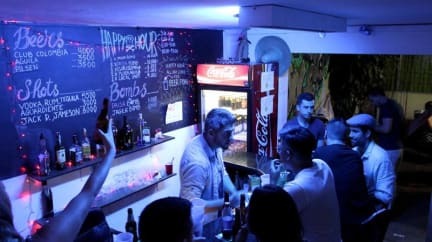 Paisa City Hostel, Medellin, Colombia i Medellin, Colombia : Boka nu! A very cheap hostel located in one of the best areas in Medellin. It's worth to stay here for a couple of nice. The owner is nice, the rooms are comfortable and the wifi works well sometimes. A bit noisy and no breakfast. I found a dead kockroach in my locker, but overall quite clean. This IS a party hostel, keep that in mind when you are deciding if you want to stay here. There is always travellers down in the bar, so you are deemed to find new friends and have parties every night. The atmosphere is good. Lots of things to do to pass time. If you however want a hostel where you can sleep at 10 or 11, you might want to consider another because the music does not stop until after twelve and sometimes even later. And some stranglers tend to stay so you will still here them.